Jan 1st to Dec 31st, 2012! Here it is! The 2012 Amish Reading Challenge!! 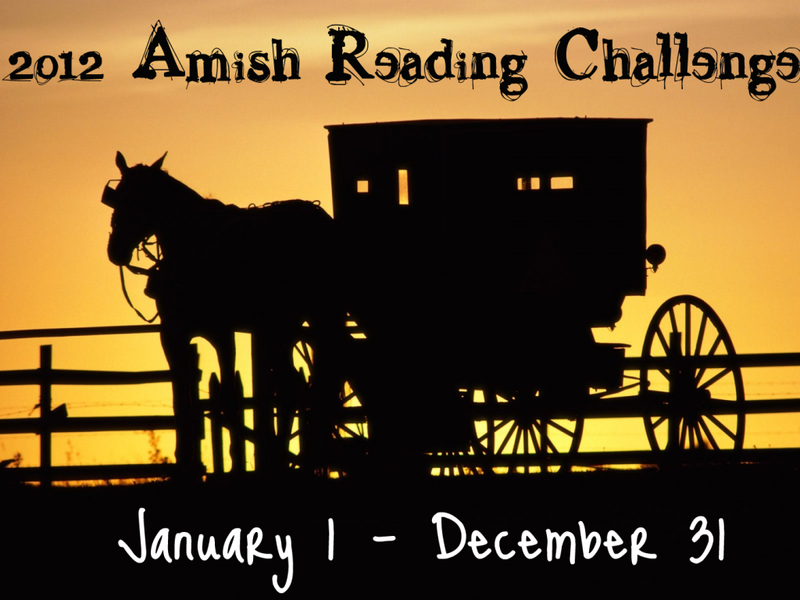 Read 15 or MORE Amish books through the entire YEAR and do a final Post, instructions will be at Molly's Blog! Clicking on 'that' link WILL take you directly to the correct page! Make SURE to follow 'this' specific link so you get to the RIGHT PLACE! You WILL need to post your POST, like I have done here, to generate your LINK to sign-up for this Challenge! There are a LOT of NEW RELEASES scheduled for the Amish Books Genre 'this year - 2012!' I'm looking VERY forward to some of them! Here are some of them! You can click on the Amazon Photos/Links and place your Pre-Release orders NOW, or order them directly from the link!! ALL proceeds from your purchase go to help support THIS BLOG! That allows me to be able to offer MORE BOOKS during Blog Hop Giveaways! When you Pre-Order, when the books release, they are shipped to you RIGHT AWAY!! DON'T MISS THEM! Sign up for YOUR pre-order today! You can't go wrong doing it that way! You are ensured to get YOUR FIRST-RUN printing! "The Keeper, A Stoney Ridge Seasons, Book 2" by Suzanne Woods Fisher. Release date is 1-2. You can read this as a stand-a-long OR read the book below this, The Haven, first! Your choice! "The Haven, A Stoney Ridge Seasons, Book 1" by Suzanne Woods Fisher, Already released! "Beyond Hope's Valley, A Big Sky Novel, Book 3", by Tricia Goyer. Release date is: 4-1 (April Fool's Day! I am NOT kidding, though!) I'm looking forward to this one! This book follows "Beside Still Waters, A Big Sky Novel, Book 1" and "Along Wooded Paths, A Big Sky Novel"! This 'can' be a read as a stand-a-lone novel, OR you can read the other 2 books in the series as they were SO enjoyable! You definitely have the time while waiting for this to release on 4-1. "Beside Still Waters, A Big Sky Novel, Book 1", by Tricia Goyer. "Jacob's Daughter" by Samantha Jillian Barr / INDIE Author who writes EXCELLENT BOOKS! She has written MANY books about the Amish! She does NOT write cookie-cutter books at ALL. NONE of these books I have highlighted are the cookie-cutter type Amish books we are growing to not like anymore. This author, Samantha Jillian Barr really puts some 'spin' on her books! Check her books out, they are VERY much worth reading! I have this one to read and review for her! Can't wait to get started on it! IT IS released now! Only $1.99 at Amazon! Her books are just as priceless as these top names in Amish writing I have highlighted! Well, there you have it! I have just highlighted "7" books AND NEW Releases in the Amish Genre! I have picked out HALF of the Amish books for your reading pleasure! After these, you ONLY have '7' more to choose and read! I 'do' want to Highlight ONE MORE BOOK! This book takes us to Europe, to Switzerland, to be exact! This book was one of my favorite reads of 2011! In this book, we learn ALL there is to know, just about, about the Anabaptist Movement! Wow! The research that went into this book in order for her to have written it! I want to send a message to the author and ask her if she, herself, DID go to Europe to do some of the research! It is so FULL and rich with history! WELL-WORTH the read! "The Amish Nanny, The Women of Lancaster County, Book 2", by Mindy Starns Clark and Leslie Gould. You would NOT expect this book to go into SO much history, NOR take us to Europe, in Switzerland, where the Amish originated as Anabaptist's. This book is full of RICH HISTORY, and a little romance! A CAN'T MISS! "The Amish MidWife, The Women of Lancaster County, Book 1" by Mindy Stearns Clark and Leslie Gould. And, a NEW RELEASE already AVAILABLE by Beverly Lewis, "The Mercy, A Rose Trilogy, Book 3". I received this book to read and post a review! There ARE 2 previous books to this series. I will be reading 'this' book as a stand-a-lone, and will let you know how I like it! Beverly Lewis has SO many Amish books out there, wow! Just like Wanda E. Brunstetter! Well, I just highlighted "10" Amish books that are ALL 5-Stars, or into the 5-Star reviews! This would ONLY leave you '5' books left to choose on your own! You could read the first 2 of Beverly Lewis' , The Rose Trilogy, and MORE from Samantha Jillian Barr! She has at 'least' "8" Amish books she has published! They are ALL EXCELLENT! That would take you well OVER 15 for this year! The way "I" like to read the Amish books, also given the nickname of 'Bonnet Books', is to read one, then read a different genre. I go back and forth that way. That is 'my' style of reading the Amish genre. What is YOUR style? Leave a comment!! I'd LOVE to know! Thanks for reading ALL my suggestions for this year! This IS ONLY January, too! I know there are MANY other New Releases scheduled for this year, just not 'yet' announced! This genre is HUGE! VERY Popular! Enjoy your reading and this Challenge! Now REMEMBER to go back up to the TOP of this Post and go click on Reviews by Molly, read the directions, and sign up for this Challenge! I have MORE information about this Challenge on my CHALLENGES PAGE!! Go on over there, and just maybe you WILL FIND MORE CHALLENGES you will WANT TO PARTICIPATE IN! I have quite a few I am participating in! Here's MY link: http://lauriehere.blogspot.com/p/challenges.html?showComment=1325425769415 OR, click on the CHALLENGES tab up above! Thank you for joining Laurie!